Nothing can prepare you for cosmic entities from another dimension. Except something that combats cosmic entities from another dimension. They can’t do much else otherwise, but maaaaaaaaan can they beat those otherworldly extraterrestrials! …okay, those are your crossword puzzle answers and SAT words for the day. Sceptile is a Stage 2 Grass Pokemon, 140 HP, with a Fire Weakness, no Resistance, and a Retreat Cost of 1. His Power of Nature Ability prevents damage done to any of your Pokemon with Grass Energy by an Ultra Beast, while Powerful Storm is a 1-cost move that does 20 damage for every Energy attached to all of your Pokemon. All things considered, Sceptile has a fairly niche use with his Ability. It’s relevant to a degree even now against things like Buzzwole-GX, a deck that’s likely not going anywhere anytime soon, seeing what we’re getting in the next set. But it doesn’t counteract every deck – not every deck, believe it or not, has Ultra Beasts in it. Sure, it’ll also help against things like Ultra Necrozma-GX and the other variants of Necrozma-GX, but you’ve still got a good portion of the metagame that’s not centered around Ultra Beasts. Even Buzzwole-GX is usually partnered up with Lycanroc-GX or Zoroark-GX. Which is why it’s great that Powerful Storm is so cheap and yet so high in damage potential. Will Sceptile see play in its own deck? It depends on if there’s a Grass deck capable of running him right now. Tapu Bulu-GX, for instance, doesn’t want to run Sceptile on top of the Vikavolt commitment, and there’s not really another major contender for Grass decks…well, except Golisopod-GX, who might benefit from Sceptile as an alternate attacker with protection. Overall though, Grass decks aren’t particularly relevant at the moment, so Sceptile might be left on the way side for the moment. Don’t sleep on him though – there’s a strong chance he might make an appearance as an alternate attacker in the next big Grass deck. Arora Notealus: Sceptile’s one of those Pokemon that’s meant to counter a specific mechanic or card type in the game. These kinds of cards are always fascinating in their own right to look at, considering that the bigger the card pool gets to include things that aren’t specifically what it counters, the less likely they see play. But when those decks are relevant, then the play of their checks like this will show up more and more. Next Time: Time to get your hustle on! Today, we look at another Hoenn starter that is Sceptile! A Stage 2 Grass Type with 140 HP, weak to Fire, and a retreat cost of one, it has an ability and an attack. Power of Nature protects your Pokemon – that has any Grass energy attached to it – from damage by your opponent’s Ultra Beast. 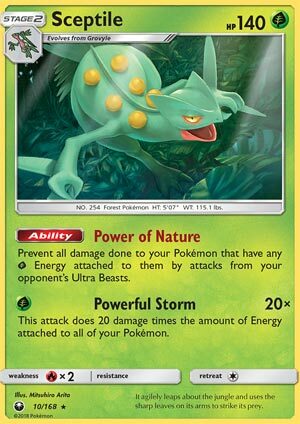 Powerful Storm costs G and does 20 damage times the amount of energy attached to all of your Pokemon. The things Sceptile tries to do seems limited. Some of the most frequent Ultra Beasts that are used are Necrozma forms, Buzzwole (GX and/or non-GX) and Naganadel-GX (Beast Box), with Blacephalon-GX awaiting experimentation. When the card pool keeps expanding, eventually we would describe this mechanic as a “small fraction out of the entire format”. For however many years the Pokemon TCG will keep on continuing, even EX and GX Pokemon would be described this way. Powerful storm is an attack that seems good on paper, but not so much in practice because couple things can go wrong. This takes a LOT of work to achieve KOs. If we’re talking about the most HP of a Basic Pokémon based on printed HP scores, then it takes a Choice Band and TWELVE energies in play to OHKO it. Which is what decks can barely contain unless they use Special Energies that provide two or more units. Meanwhile, a rogue Frost Rotom or Espeon will return fire for a possible KO because of one of their attacks doing damage based on your Energy on the board. Sceptile (CES 10) slithers into the meta from the Celestial Storm expansion set. This 140 HP Stage 2 Pokemon caught everyone’s eye because of its ability Power of Nature which allows not just Sceptile but ALL of your Pokemon with Grass energy attached to them to be immune from damage (not effects though) done by your opponent’s Ultra Beasts. Sigh if only there were any competitive Ultra Beasts in the format today. Sceptile also has a good attack in Powerful Storm that does twenty damage times the amount of Energy cards attached to all of your Pokemon. Pretty good for being a single Grass attachment, and it synergizes well with the ability. I’ve gone 7 W 4 L against Sceptile since the start of the new rotation. It was not played in any of the four major Standard tournaments so far this season. I don’t know what to tell you. It’s a Stage 2, it’s Fire weak, every Ultra Beast archetype has multiple non Ultra Beast attackers, it takes too long to get enough energy down on the board. It seems like it would be a competitive archetype, but that’s just the state of the game today. And it’s not getting any easier for Stage 2’s on Friday. Lost March is going to be too fast for them to compete against. I get it that Broken Time Space can’t be reintroduced into the game, but if they want to make Stage 2’s relevant, they need to do something. I mean, I kind of like that in Pokemon GO my best Pokemon are almost all Stage 2’s. Only two of my top ten Pokemon in Pokemon GO are Stage 1’s. No Stage 2’s are relevant today… Jumpluff (LOT) might change that however…. Sceptile (SM – Celestial Storm 10/168) opens our week. This is a Stage 2 [G] Type Pokémon that does not currently have a great Stage 1 form from which to Evolve, nor a great Basic. It also lacks a super-shortcut, so Sceptile has a big hill to climb to qualify for competitive play. 140 HP isn’t helping, but it isn’t hurting it too bad, either. [R] Weakness could be an issue in the future, but for now isn’t too bad. Lack of Resistance is typical even if it is also the worst. A Retreat Cost of [C] is actually pretty good, especially in the post-Float Stone era of Standard. “Power of Nature” is good but not great; there are many Ultra Beasts seeing successful competitive play but the top decks aren’t running on just Ultra Beasts, so they can shift to their other attacker to get around this effect. The protection Power of Nature offers requires that the Pokémon in question have [G] Energy attached, so there additional ways around Power of Nature; shutting down Abilities, forcing up something without any [G] Energy attached, or discarding all [G] Energy from the target you wish to attack. Put it all together, and you less of a wall your opponent must punch through (if they are even able) and more of a shield with which you may be able to deflect some blows. Power of Nature also does nothing to protect from attack effects. Sceptile also has the attack “Powerful Storm”; for [G] it allows Sceptile (or anything that can copy the attack) to do 20 damage times the amount of Energy you have attached to all of your Pokémon. This is a good attack; you need a LOT of Energy in play to pull off OHKO’s BUT that Energy can be spread around, so when one Sceptile is KO’d, another can just step up and easily take its place. What keeps it from being great are that it is on a Stage 2 AND it really needs to do at least 30 per Energy in the current metagame. Even OHKOing a 130 HP target like Buzzwole means Sceptile requires you have seven Energy in play. You’ll need a Choice Band or two more Energy to OHKO a 170 HP Pokémon-GX like Tapu Lele-GX. Want to OHKO Buzzwole-GX? 10 total Energy on your side of the field or eight with a Choice Band equipped. Just OHKOing a Zoroark-GX is 10 Energy (again) but this time Choice Band requires nine Energy backing it. If a deck can get that much Energy into play, how likely is it to have the room for, let alone need, Sceptile? Fortunately, SM – Lost Thunder contains not only Sceptile-GX but a new Grovyle with an Ability that allows you a once-per-turn (per copy) search for a [G] Type to add from your deck to your hand. It also looks like Ultra Beasts will remain a competitive part of the metagame, including being the main attacker in an upcoming [R] deck that has already seen significant success in Japan. So, very soon, this Sceptile becomes a one-of (maybe even a two-of) in such a deck. FOR NOW, however, it is a little too niche for its own good in Standard. Expanded may present more combo opportunities, but not enough to offset the increased competition for deck space AND all the strong decks that use few or no Ultra Beasts. In both the Limited and Theme Formats, Sceptile has some chops. The catch is that you need a field full of Energy backing it in either of those Formats and in the Theme Format I don’t think there are any Ultra Beasts (so the Ability is pointless). The “Leaf Charge” Theme Deck contains several cards that can accelerate Energy, as well as two copies of Sceptile; while the deck’s secondary attackers aren’t super strong, they are more than adequate if you can send out a Sceptile or two first, saving their HP and Energy for clean-up duty. SM – Celestial Storm contains some of these cards, so if your pulls are lucky, you can assemble quite an impressive deck… and as long as you get a 1-1-1 Sceptile line but NOT something worth running solo as a +39 a.k.a. Mulligan deck, I’d slip it and two or three basic Grass Energy cards into your deck. Sceptile has decent effects but they don’t work so well on a Stage 2. However, you need to remember this card once Sceptile-GX releases in SM – Lost Thunder.